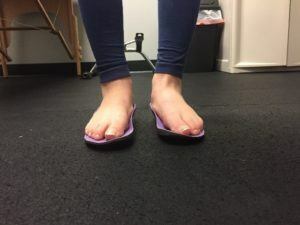 ABC Pediatric Therapy - Why does my child need orthotics? ABC Pediatric Therapy - Why does my child need orthotics? Why does my child need orthotics? There are many reasons why a child may benefit from orthotic intervention at all different ages, with and without a medical diagnosis. The use of orthotics can vary from child to child, however, the main goal is to provide stability while promoting functional ability. Orthotics can range from shoe inserts to knee high braces and more. They can be used to assist with flat feet, toe walking, weakness, poor balance, frequent tripping, leg length discrepancies, and etc. Orthotics are made to improve a child’s walking pattern to as normal for THEM as possible to facilitate age appropriate child development. As a physical therapist, I hear more often than not that “my child’s doctor said they would grow out of it.” This may be the case for some children, but not all children are the same. Our posture and the way we walk begin in the womb and continue to develop through infancy and beyond. The way we walk is affected by our strength, flexibility, endurance, sensory processing, balance, and more. We cannot assume that because one child grew out of toe walking, all children will. There are many factors to consider and assess with each and every individual child. 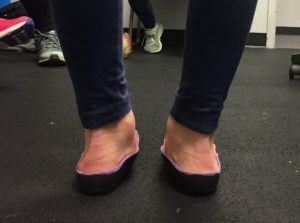 The photos below are of a child whose mom had concerns about her foot position as soon as she began walking. Her primary care provider told her that she would grow out of it. She is now 9 years old and has significant ankle pain with running, jumping and long distant walking. With the use of custom orthotics and physical therapy services her pain has improved significantly. She will occasionally still have pain with higher impact sports, however, it is less frequent and she is now able to enjoy playing with her friends. A child’s medial column of their foot, which means the middle of their foot (arch), does not fully develop until the age of 7-8 years old. This means that the forces we place upon our feet during this time frame will significantly impact the structure of them. 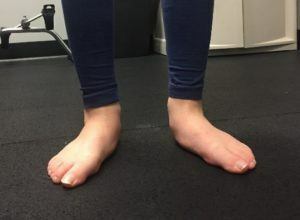 If a child is compensating in the way they are standing, walking, running it could lead to foot abnormalities when they get older which could potentially lead to pain and/or decreased function in their day to day lives. It is also important to note that because orthotics promote function, if a child is having difficulty learning to walk, jump, run, hop, or any gross motor activity that orthotics could be beneficial in helping facilitate those motor milestones. If you have concerns about your child’s foot position, posture, walking, and/gross motor development I highly recommend consulting with your pediatrician, as well as, a physical therapist to make sure that there are not underlying deficits and to determine if your child would benefit from orthotic intervention. There is not one specific type of orthotic for any given diagnosis or deficit. There are so many options of orthotics available and a good physical therapist will help you determine what is best for your child.